For me, the best thing to happen in 2017 (so far!) was the Women’s March. It was inspiring, courageous and empowering to see so many like-minded people, all coming together to protest issues that affected women’s fundamental rights. It’s safe to say the sheer number of people marching shocked me, along with the rest of the public. Whilst it was incredible to witness, I couldn’t help but feel a little disappointed that I couldn’t join in; as someone with a Saturday job that just wasn’t possible. This is where Twitter comes in. The march itself trended on Twitter for 3 days, trending higher than many of the news stories about the very things and people it was protesting. 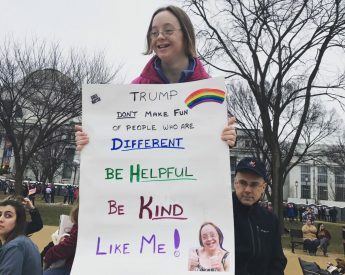 What was more interesting, however, was the content that was posted: creative, funny placards held by people of all genders, races, ages; little girls with signs saying they can do anything; tweets explaining what was happening at the marches; quotes from inspirational women; and messages of support from those like me, who couldn’t make it to the marches. Through Twitter I, along with many others, was able to feel included, have my input and let people know that these issues matter! In some ways, it can be said that there was a second kind of protest, one that was online. However, one of the benefits of Twitter, that it can reach anyone, can also be a huge disadvantage. An example of this is Jess Phillips MP. Known for being very outspoken, she experiences daily bullying online from people with opposing views. This isn’t just people disagreeing with her, however, it is abusive insults directed at her personally. Many of the comments reference the fact that she is female, as if it matters? Moreover, the threats have been violent, causing her to worry about her family, and even go as far as change her locks at home. She has been very public about the messages she receives and often comes up with witty replies, showing those against her she can rise above their tormenting. Twitter is an invaluable asset for feminism today. It not only links people with the same beliefs together, but it is a tool to spread the message of feminism globally. In 2016 I attended CSW60, a UN women’s rights conference in New York. Whilst there I met some amazing people and, when I came home, I was able to continue to see the projects they were working on and to keep in touch, simply by exchanging Twitter handles when we met. The power of social media is limitless. To use an example from my personal experience, I tweeted a photo from CSW60, which was then retweeted by a politician, and from there managed to reach 4000 people. That is just one small example. Furthermore, Twitter is a place where anyone can follow anyone; politicians, celebrities, parents, co-workers etc. This means that you have the power to try to change people’s minds. Granted, 140 characters is hardly enough for a full debate, but it is enough to call people out if they’re saying something that isn’t quite right, or to link an article that is worth reading. When speaking in the House of Commons for a NAWO Young Women’s Alliance event, we were able to take pictures, tweet quotes and even live stream a whole event. 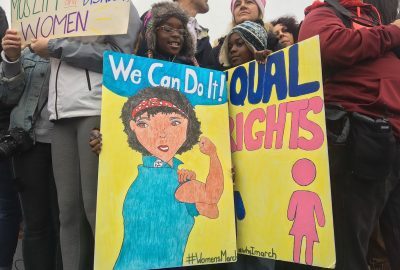 It is through platforms like Twitter, Facebook, Instagram and many more that the message of feminism is able to be spread in a world that is surrounded by technology. Personally, I am excited to see how much change can be instigated from Twitter in the future, because as my favourite placard from the march says ‘our arms are tired from holding this sign since the 60s’. This blog post was written as part of Catherine’s contribution to NAWO’s Young Women’s Alliance Advance programme, enabling young women to gain the knowledge, confidence and capacity to call for the rights of women and girls. You can find out more on YWA Advance, and the celebratory event, including human rights organisations and parliamentarians in the Houses of Parliament on 30th November 2016 here.